§ 3. 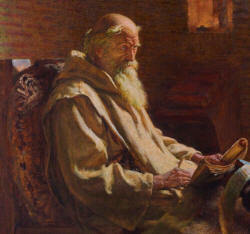 THE beginning of our history of the life of the blessed Cuthbert is hallowed by Jeremy the Prophet, who, in exaltation of the anchorite’s perfect state, says, “It is good for a man, when he hath borne the yoke from his youth, he shall sit alone, and shall be silent, because he shall raise himself above himself.” For, inspired by the sweetness of this good, Cuthbert, the man of God, from his early youth bent his neck beneath the yoke of the monastic institution; and when occasion presented itself, having laid fast hold of the anachoretic life, he rejoiced to sit apart for no small space of time, and for the sweetness of divine meditation to hold his tongue silent from human colloquy. But that he should be able to do this in his advanced years, was the effect of God’s grace inciting him gradually to the way of truth from his early childhood; for even to the eighth year of his life, which is the first year of boyhood succeeding to infancy, he gave his mind to such plays and enjoyments alone as boys delight in, so that it might be testified of him as it was of Samuel, “Moreover Cuthbert knew not yet the Lord, neither had the voice of the Lord been revealed to him.” Such was the panegyric of his boyhood, who in more ripened age was destined perfectly to know the Lord, and opening the ears of his mind to imbibe the voice of God. He took delight, as we have stated, in mirth and clamour; and, as was natural at his age, rejoiced to attach himself to the company of other boys, and to share in their sports: and because he was agile by nature, and of a quick mind, he often prevailed over them in their boyish contests, and frequently, when the rest were tired, he alone would hold out, and look triumphantly around to see if any remained to contend with him for victory. For in jumping, running, wrestling, or any other bodily exercise, he boasted that he could surpass all those who were of the same age, and even some that were older than himself. For when he was a child, he knew as a child, he thought as a child; but afterwards, when he became a man, he most abundantly laid aside all those childish things.